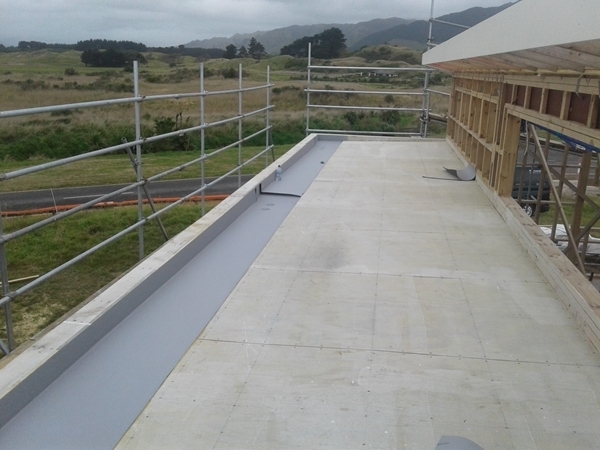 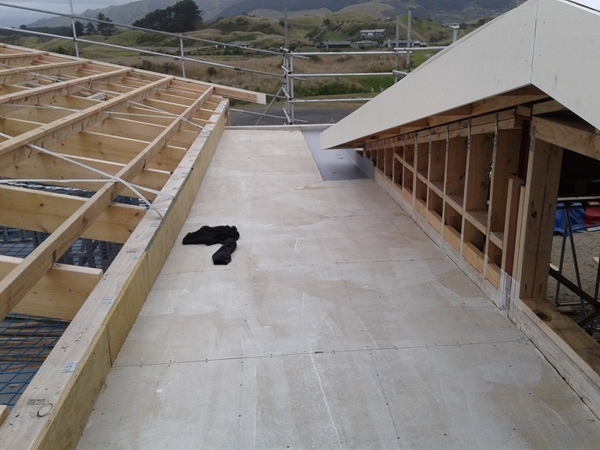 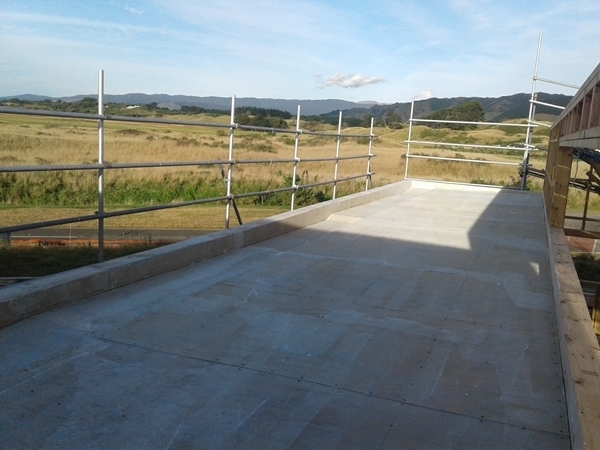 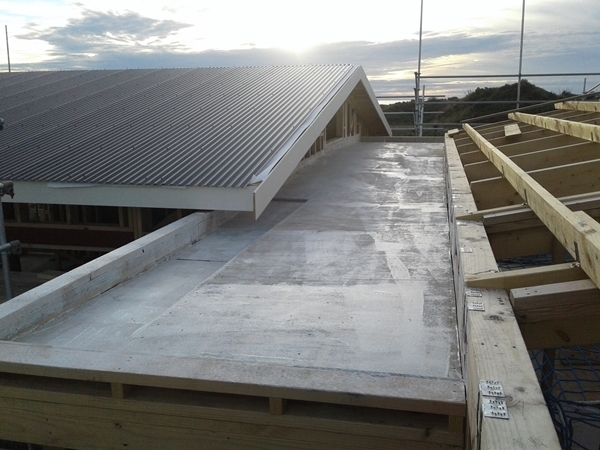 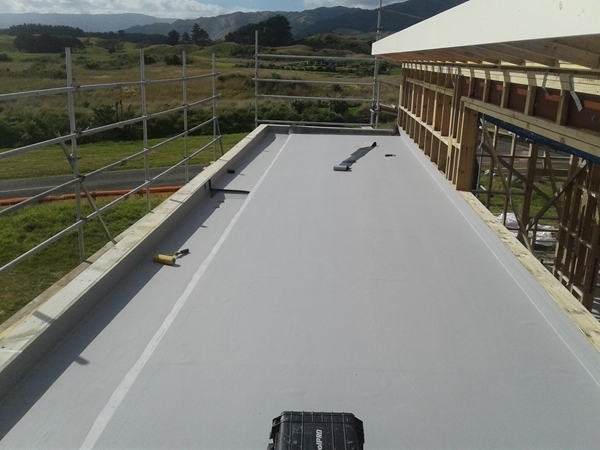 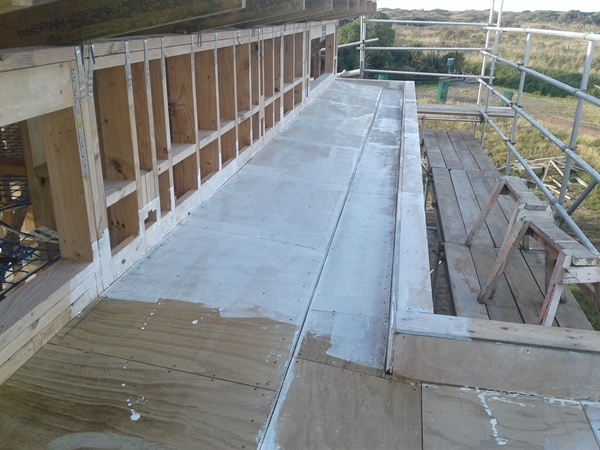 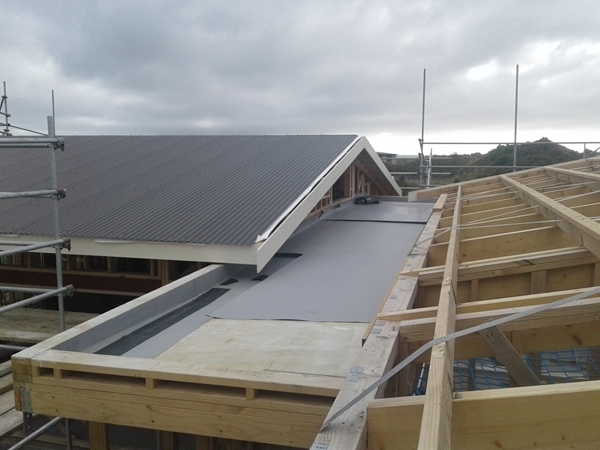 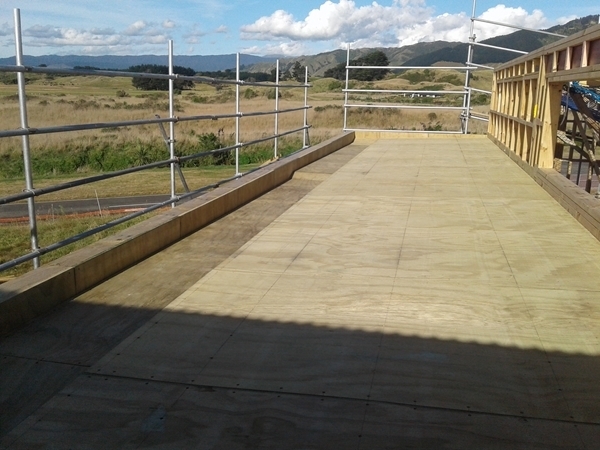 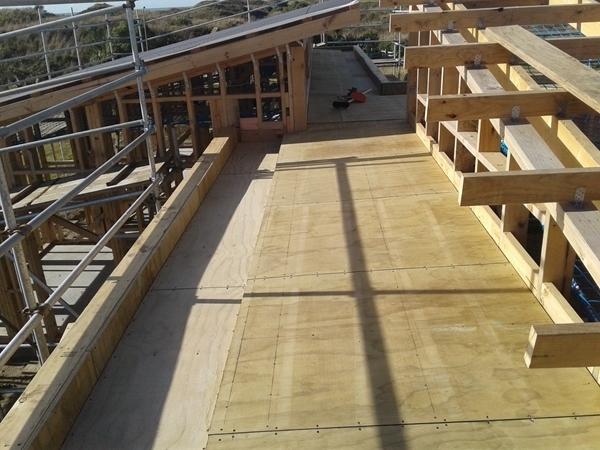 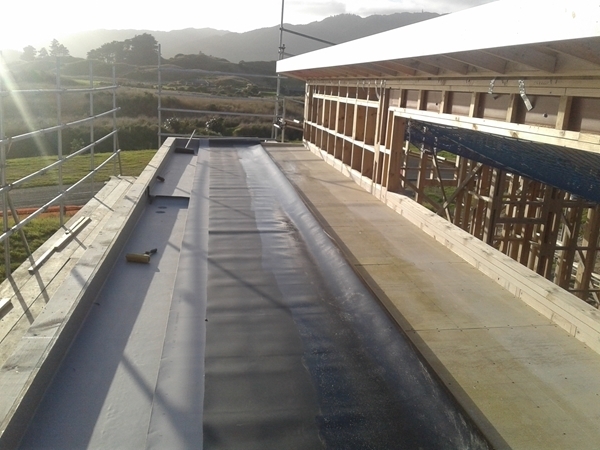 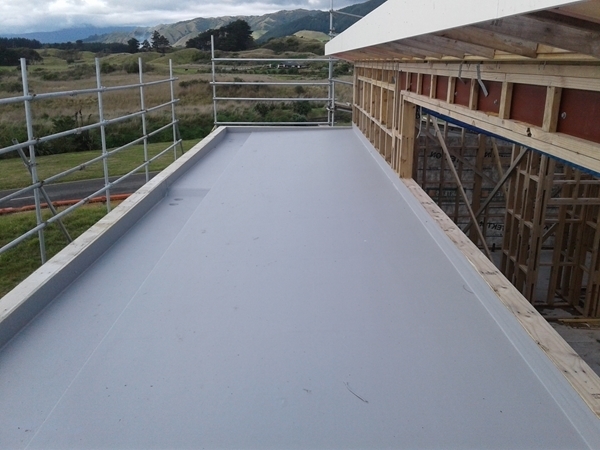 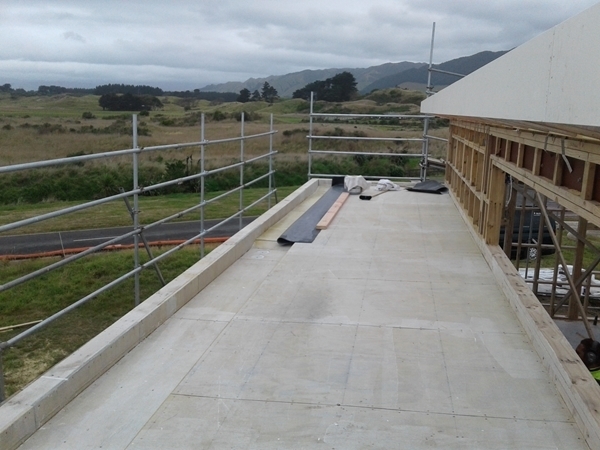 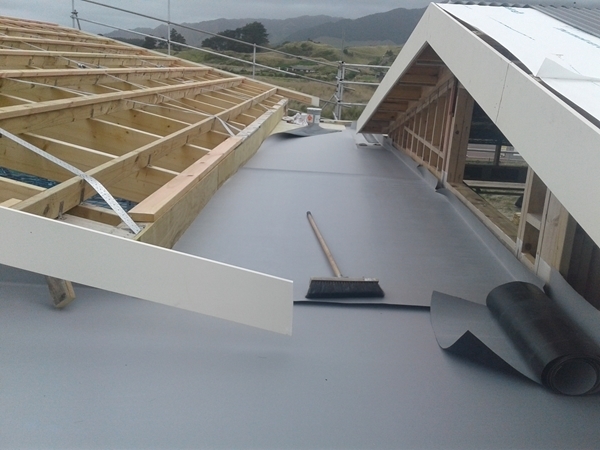 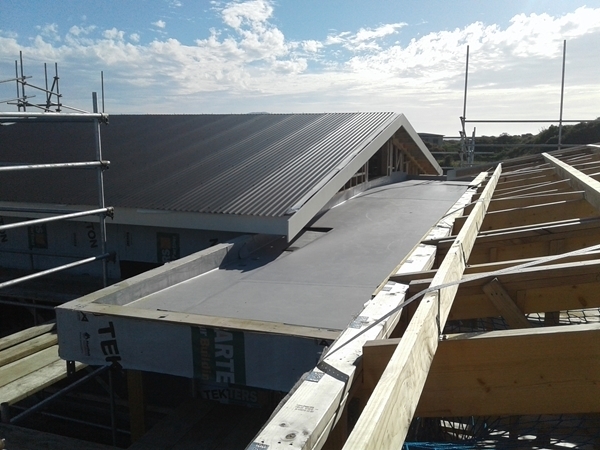 Viking Enviroclad TPO (thermoplastic polyolefin manufactured by Carlile) to new house at Pekapeka north of Waikanae. 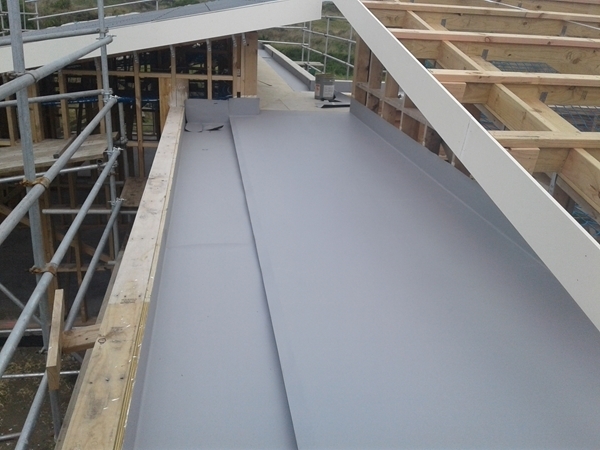 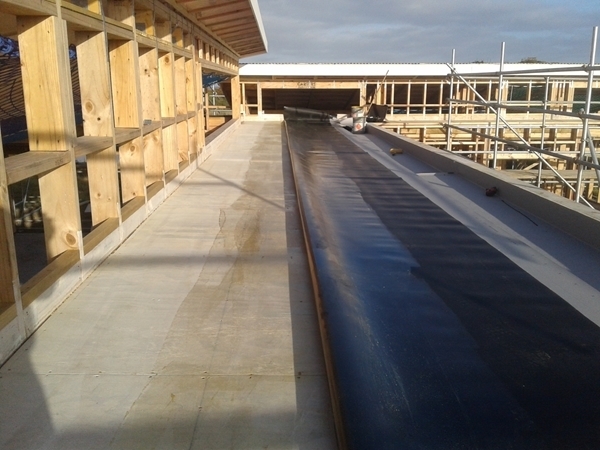 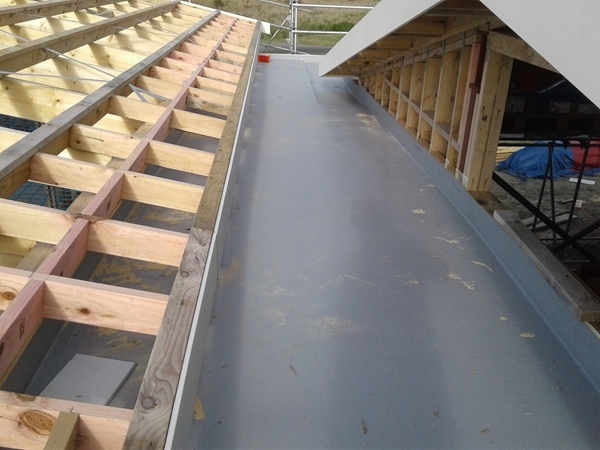 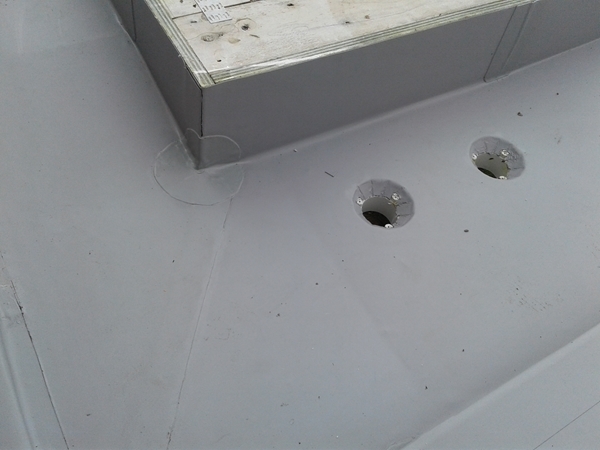 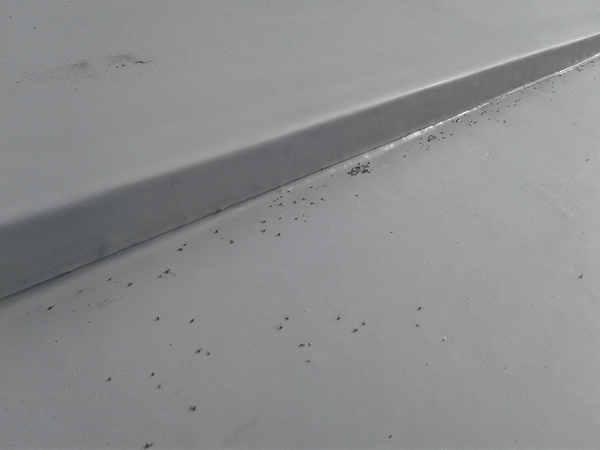 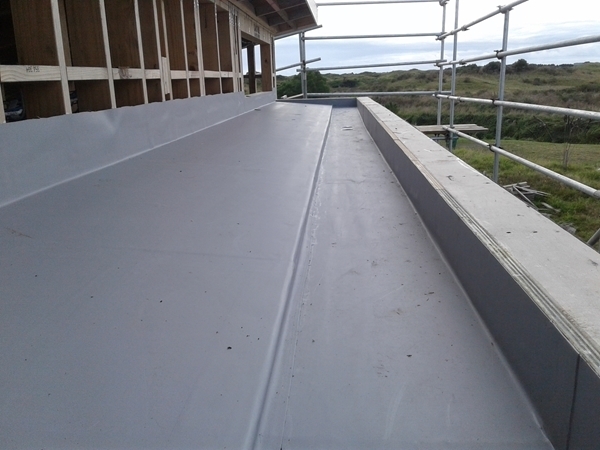 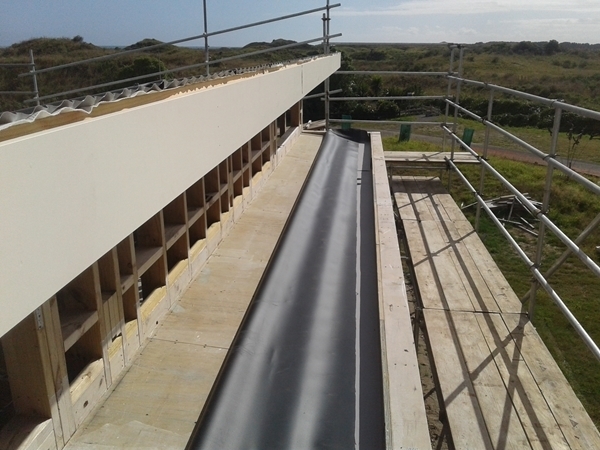 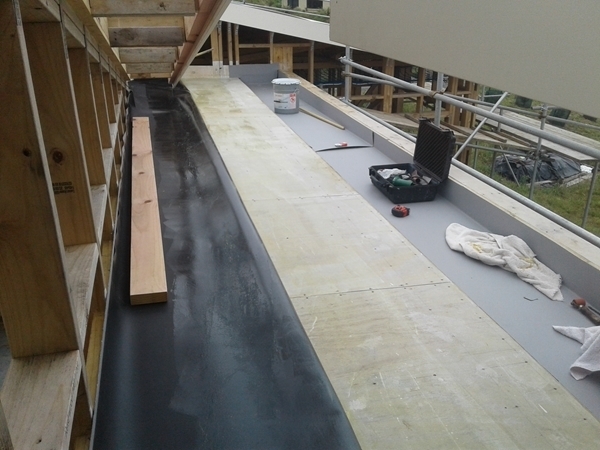 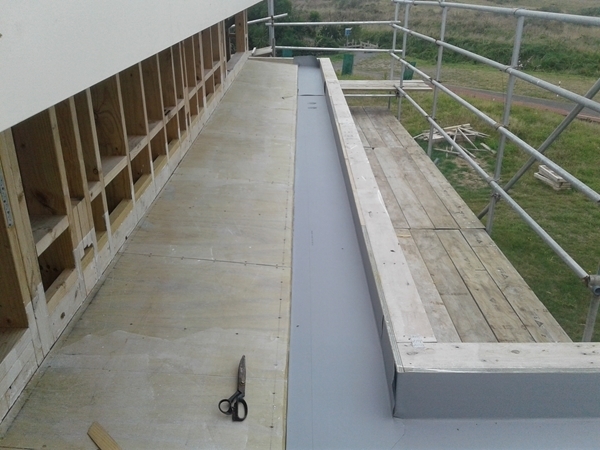 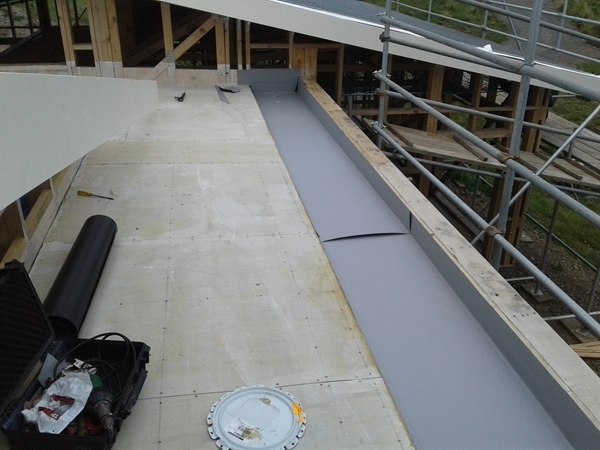 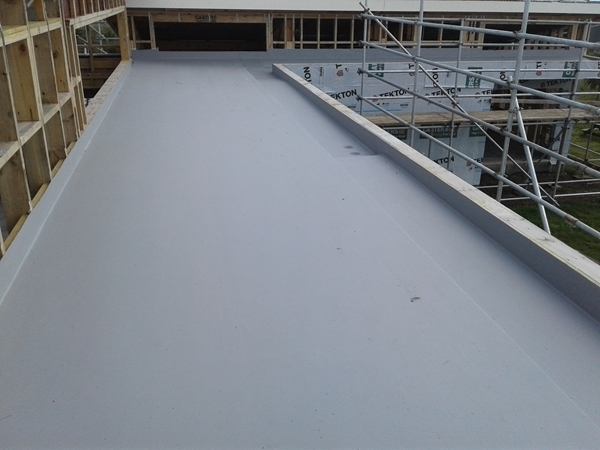 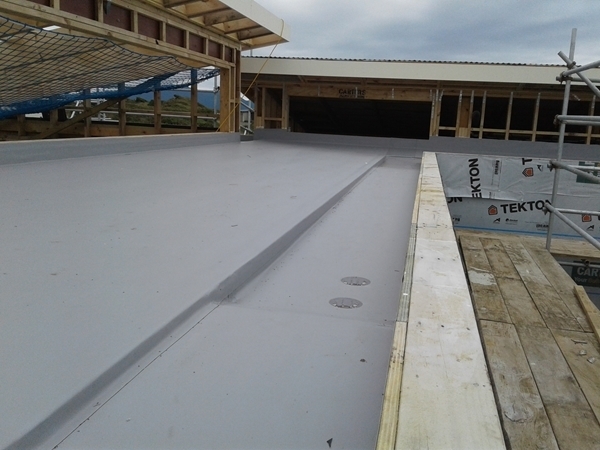 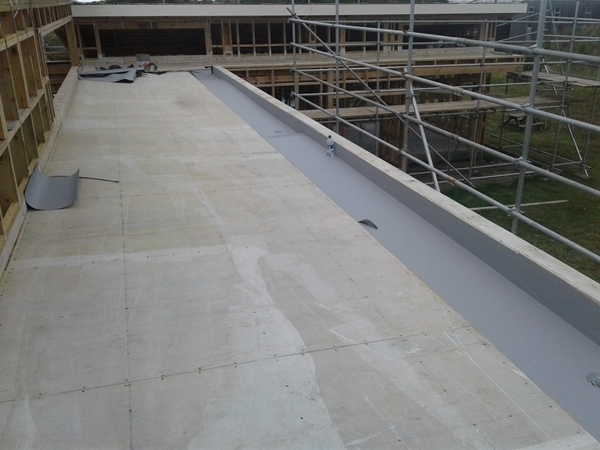 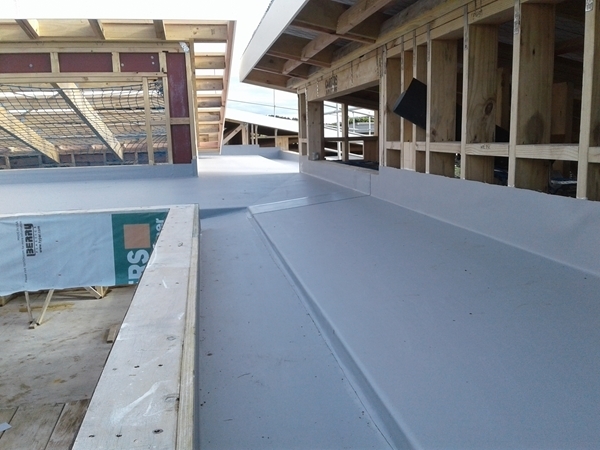 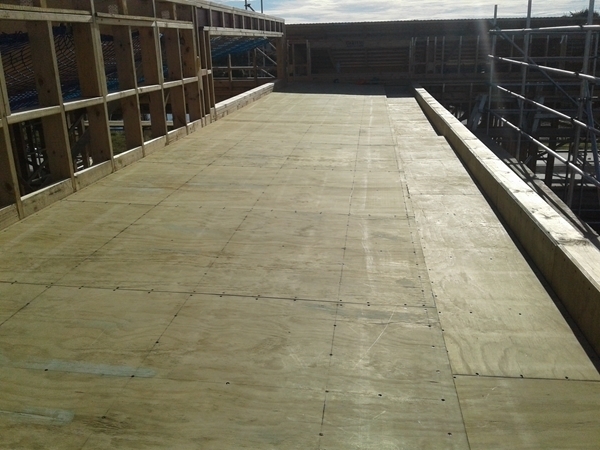 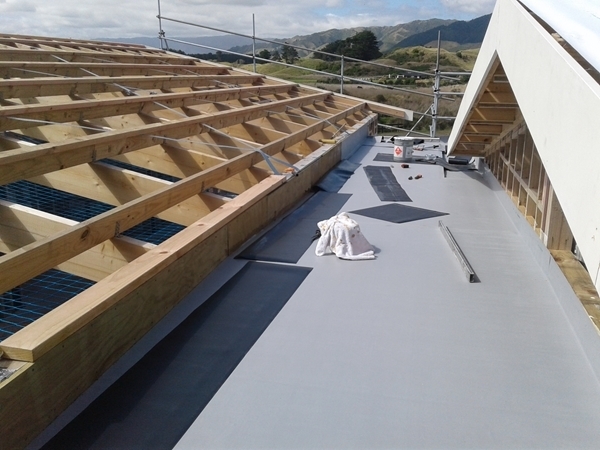 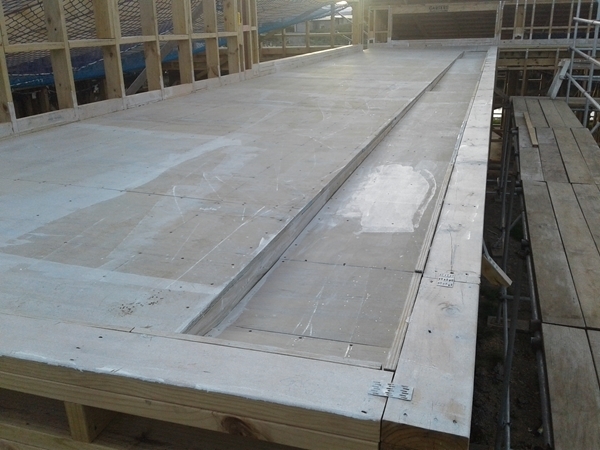 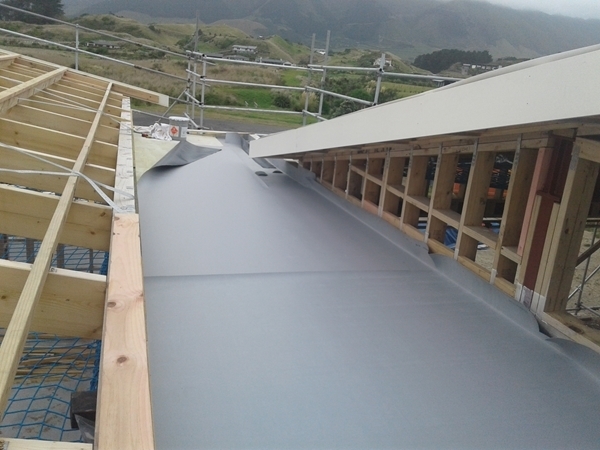 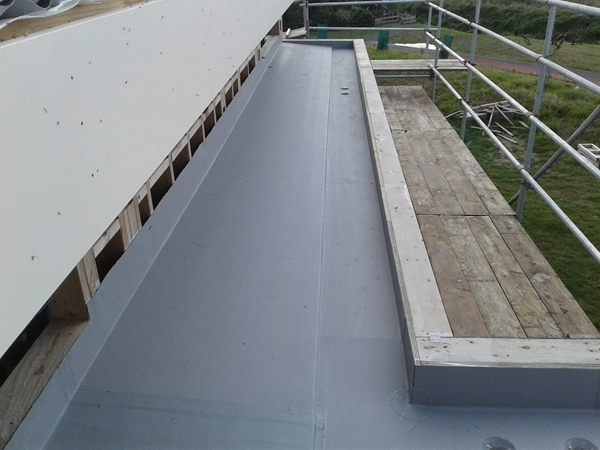 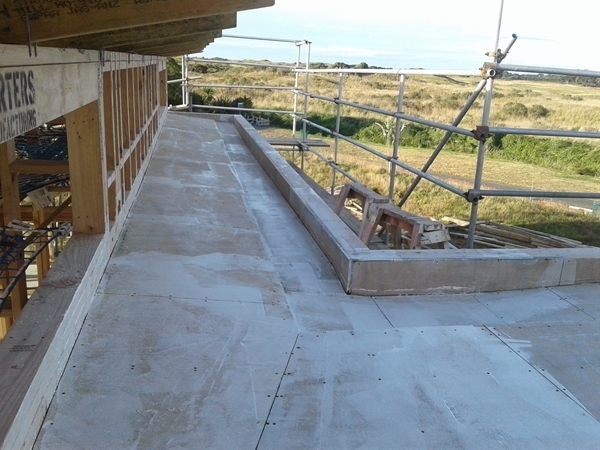 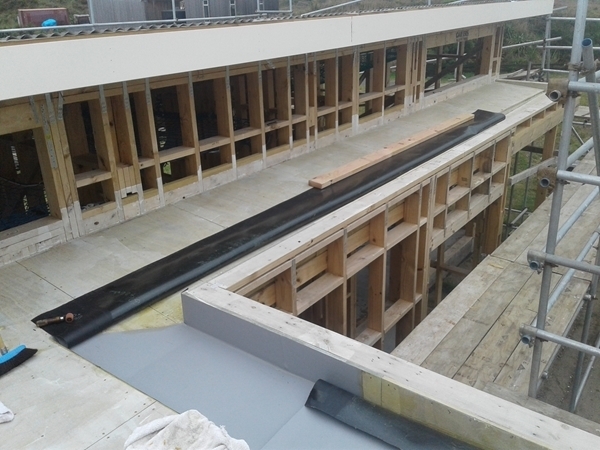 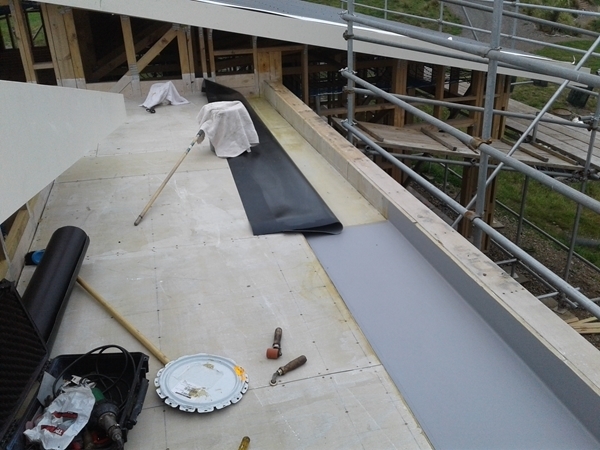 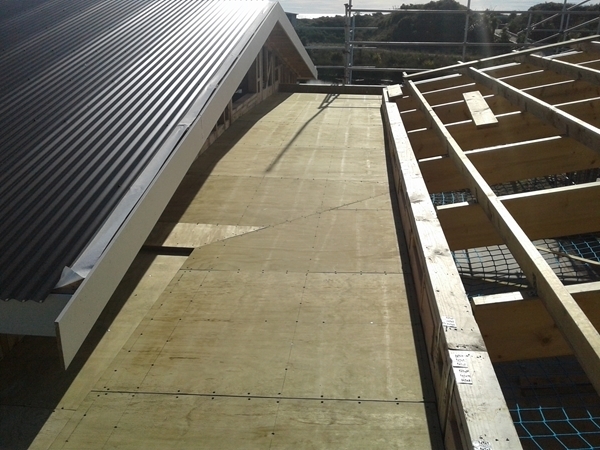 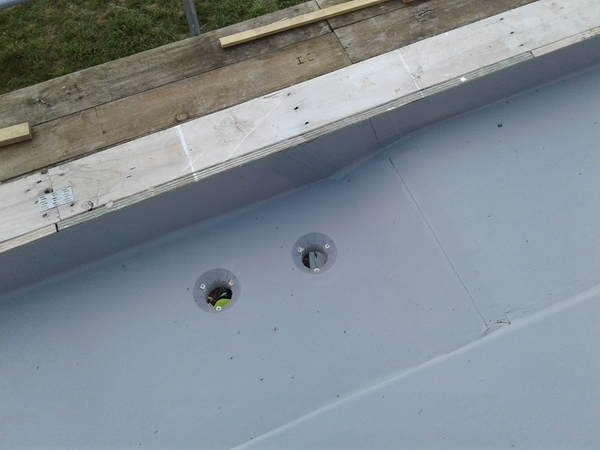 Chosen over Rubber on this project for the advantage of reduced seams, with wider and longer rolls, there are less seams on the finished roof. 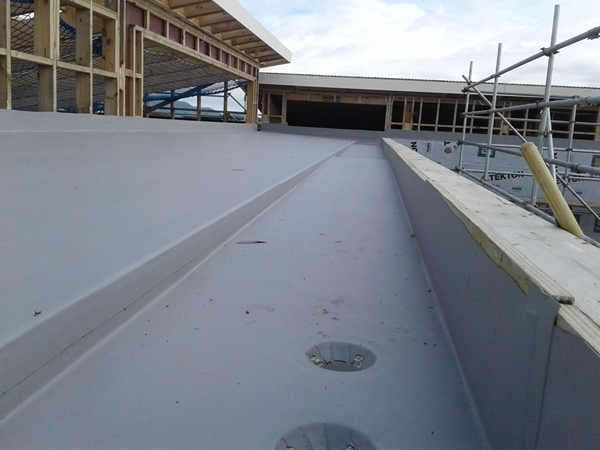 Strong seams, the seams are heat welded to create a vulcanised, watertight finish. 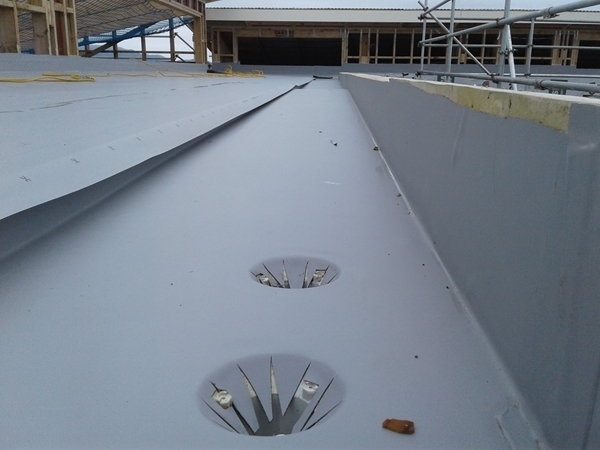 High puncture resistance less chance of damage from following trades. 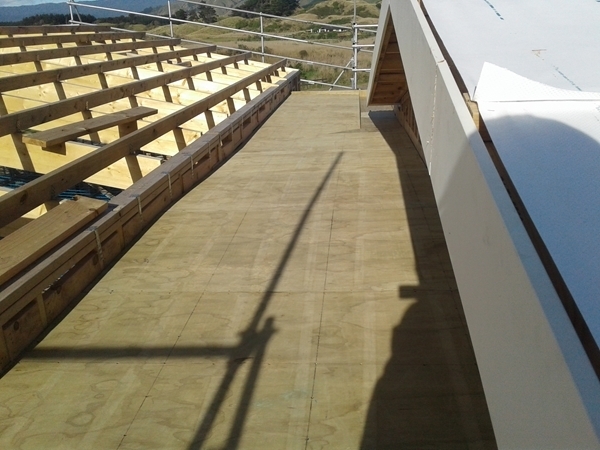 Elongation, forgives building movement which is to be expected in a multiple angled structure like this. 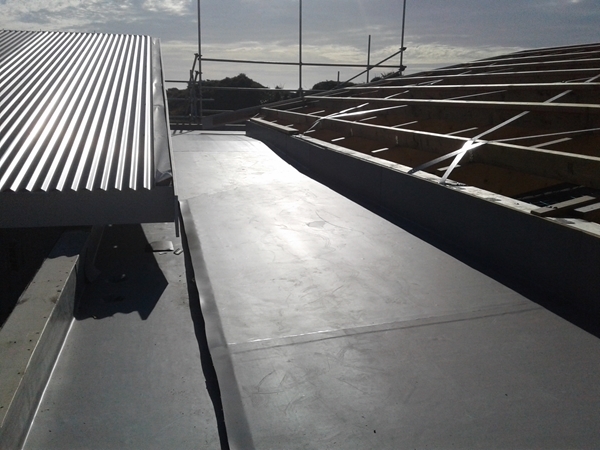 UV resistance and High solar reflectivity – Offers high solar reflectivity which can result in energy savings. 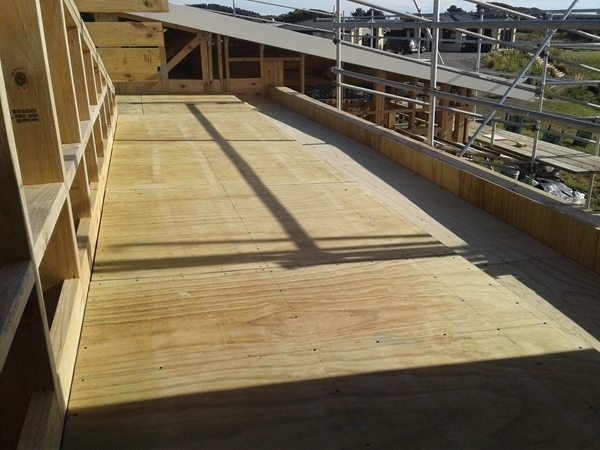 Minimum required falls are met. 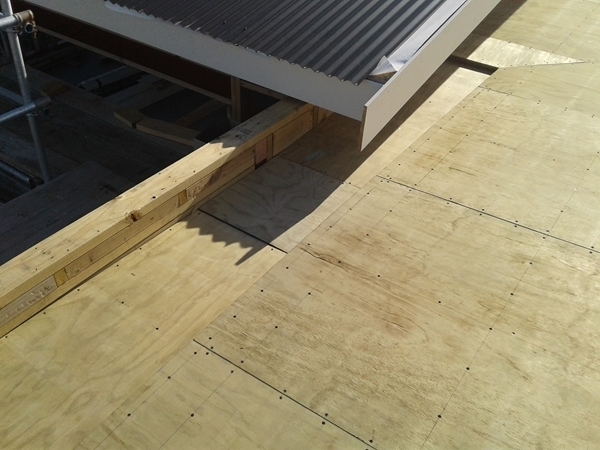 E2/AS1 2011 states 2° for roofs (~ 1:30), 1.5° for decks (~1:40), 1:100 for internal gutters. 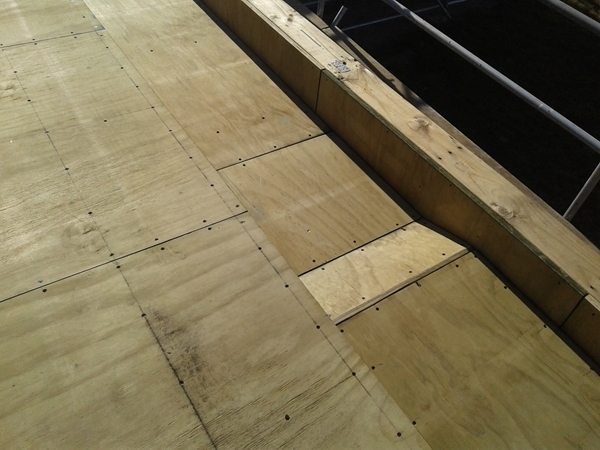 Plywood laid with the face grain at right angles to supports. 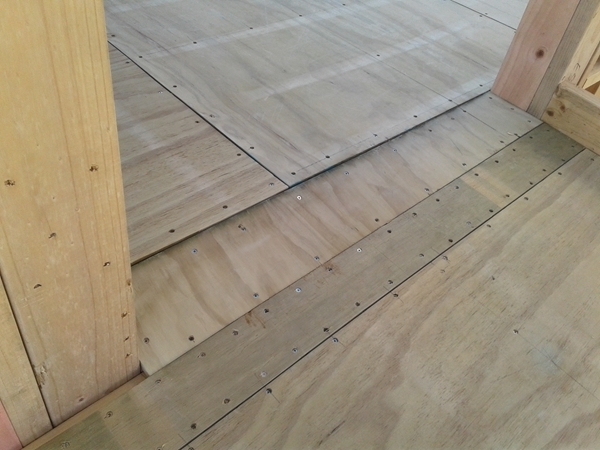 Plywood laid with staggered joints in a brick-bond pattern. 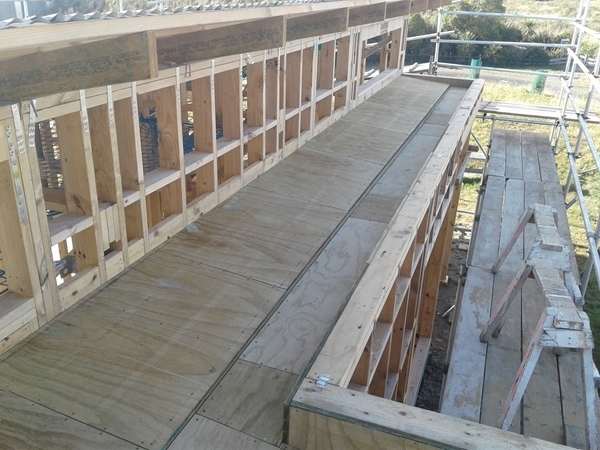 All plywood sheet edges to be fully supported by framing supports or solid blocking . 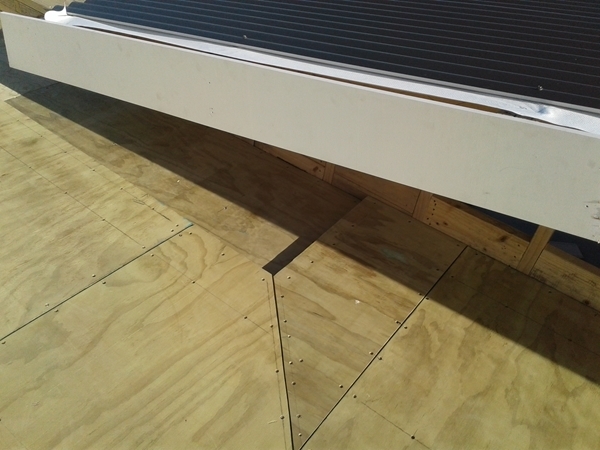 3mm expansion gap between plywood sheets at all edges. 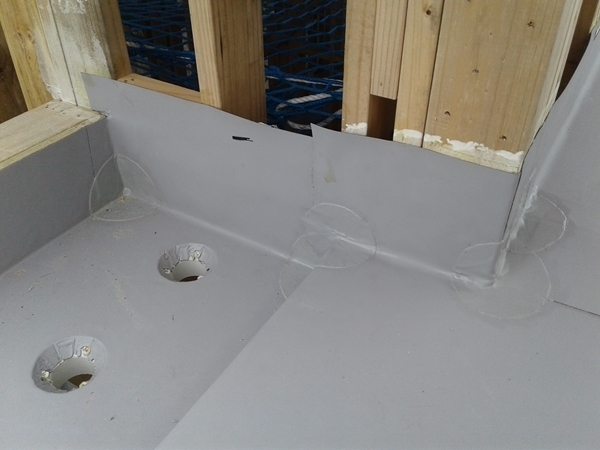 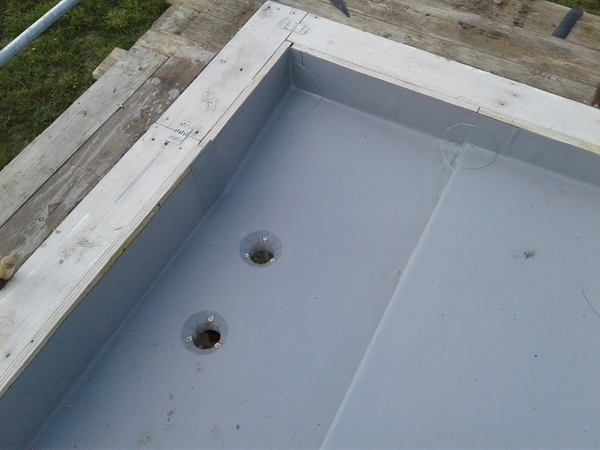 Plywood to be screwed with 10g x 50mm SS counter sunk screws at 150mm centres on all sheet edges and at 200mm centres through the body of the sheet. 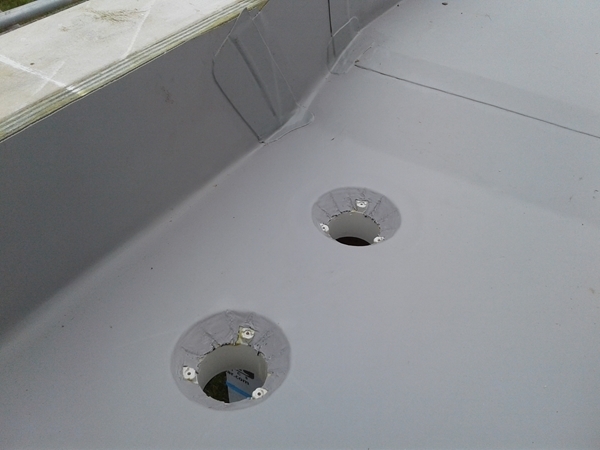 All screws counter sunk 1-2mm through the body of the sheet. 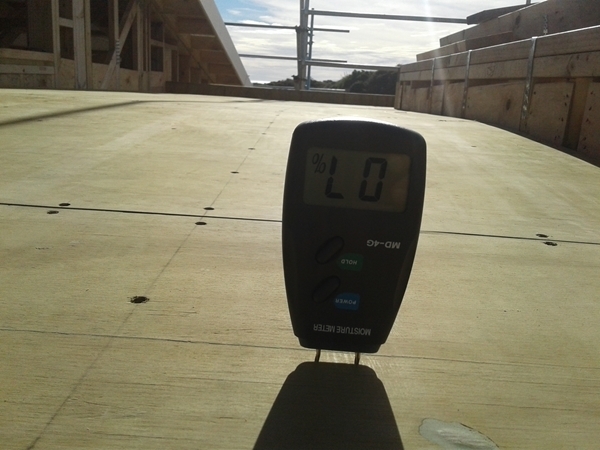 Plywood and framing supports to be at no more than 18% moisture content. 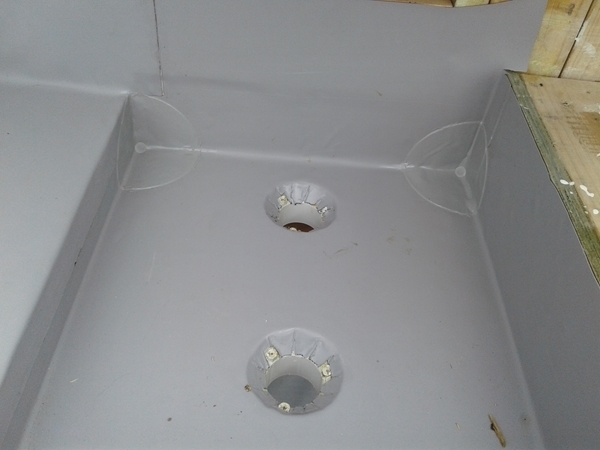 All drains and outlets are membrane compatible and fitted securely and flush with the plywood surface. 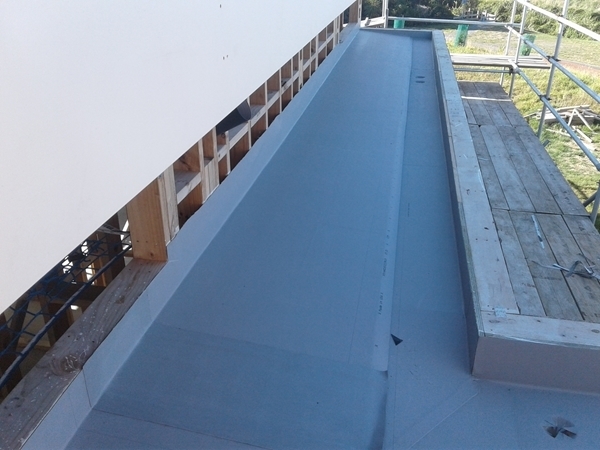 Viking Surface Sealer, is a 2 pack waterbased Epoxy System, cured films are non-glossy and exhibit exceptional adhesion, chemical and water resistance. 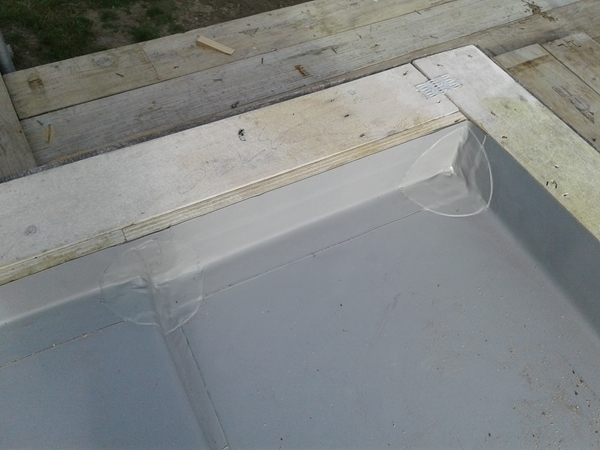 Used here to seal dry plywood prior to incoming rain before able to start the membrane installation. 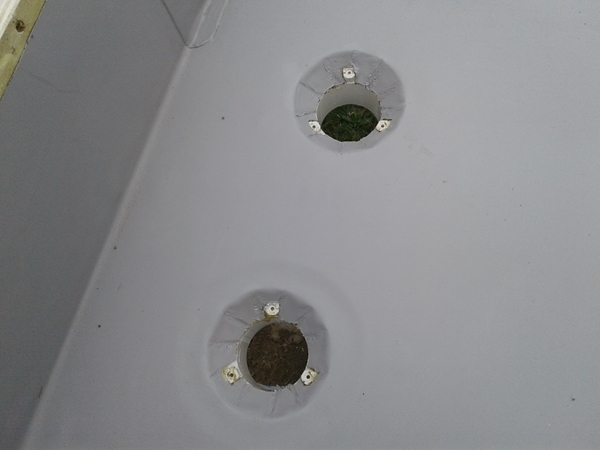 Pot life once mixed 1½ – 2 hours. 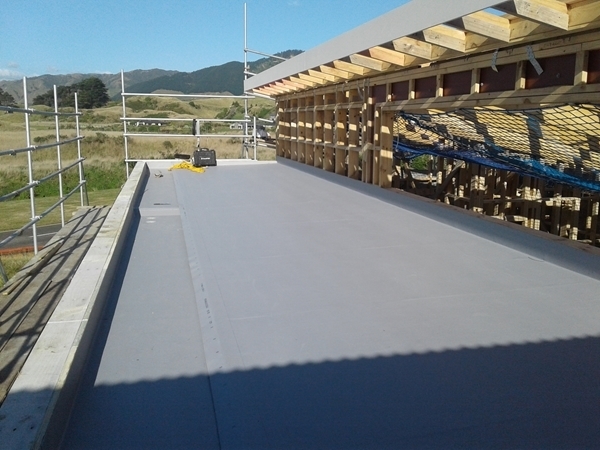 At 20°C touch dry 20 minutes – 1½ hours after which will not be effected by rain. 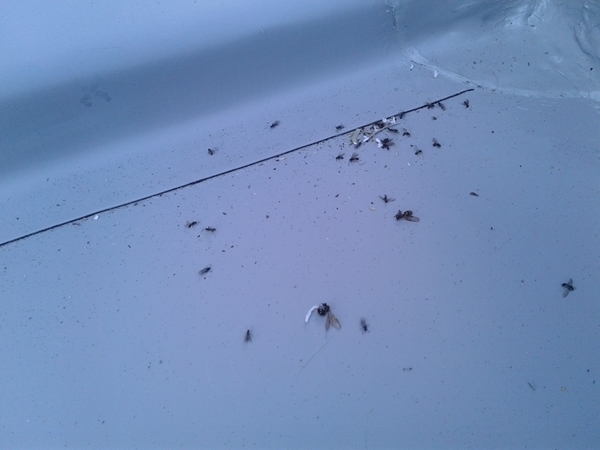 8-24 hours to full cure depending on ambient temperature. 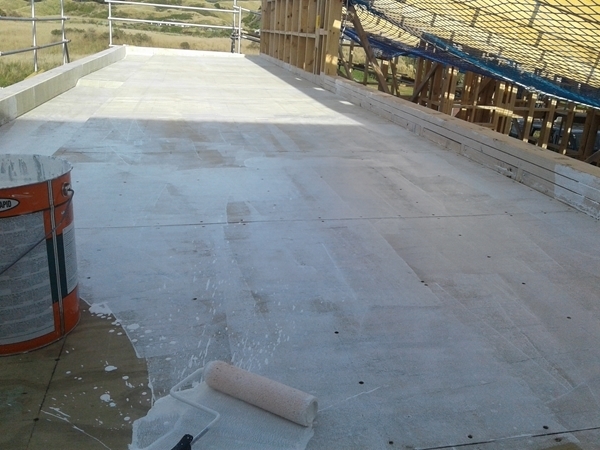 Can also be used on damp substrates to seal and allow for membrane application without waiting days/weeks for plywood to dry.